I'm always looking for new ways to serve chicken and when I came across this dish on the Betty Crocker website, I knew I had to make this recipe. We love spice in our house and the sweet, spicy, smoky combo was a hit! In 1-quart saucepan, mix preserves, lime juice, chiles and adobo sauce. Heat over low heat, stirring occasionally, until preserves are melted. Set aside. Sprinkle chicken with garlic powder, cumin, and salt. Place chicken on grill over medium heat. Cover grill; cook 15 to 20 minutes, turning once or twice and brushing with half of the glaze during last 2 minutes of grilling, until juice of chicken is clear when center of thickest part is cut. This sounds right up my alley, I know the sauce must be a wonderful combo of sweet and tangy! Will try, thanks! We love that Raspberry chipotle flavor combination and this is a fabulous Chicken. Thank you so much for sharing your awesome recipe with Full Plate Thursday. Hope you are having a great weekend and come back soon! Stop over and link this at our SUPER SUNDAY Link Party, runs through Tuesday evening! 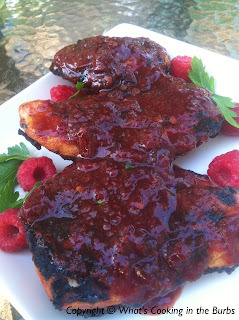 I'm lovin' the flavours in here, with the raspberry preserves, chipotle peppers and lime! Thank you for linking up to Simple Supper Tuesday.